This announcement responding to hate crimes initially passed me by, since it comes out of and is centered around Westborough. A reader alerted me to it this morning. Since we don’t have any synagogues in town, I’m sharing news on how you can befriend a synagogue next door. 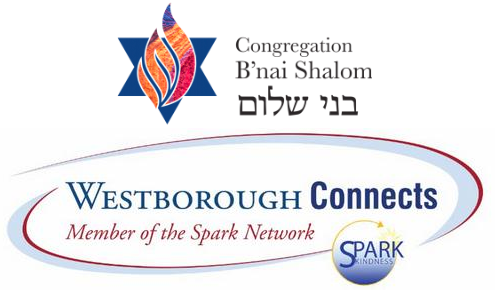 Join the Community Friendship Circle: Please join your Westborough neighbors on Friday, Nov. 9, to greet worshipers as they enter for temple at Congregation B’nai Shalom located at 117 East Main Street, Westborough. Community members interested in participating should gather at 7:00PM in the parking lot of Hastings Elementary School right next door to the temple. We will greet each other, and then proceed over in unity to form a greeting circle. Community members of all faiths are invited to join the congregation for Shabbat worship. Community leaders will also offer some words during the service. Community members of all faiths are invited to join the congregation for Shabbat worship. The congregation also invites the community to join them for a dessert reception immediately after the service. You can read the full announcement in here. the group is the first partner of the Natick-based initiative group, SPARK Kindness Networks. SPARK, which stands for “Successful Positive Authentic Resilient Kids,” is a grassroots organization that strives to support the youth through community support and kindness.